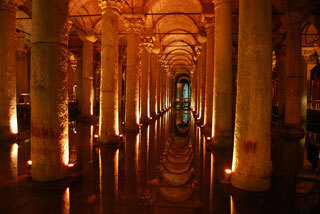 The Basilica Cistern ("Cistern Sinking Into Ground"), is the largest of several hundred ancient cisterns that lie beneath the city of Istanbul (formerly Constantinople). The cistern, located 500 feet (150 m) southwest of the Hagia Sophia on the historical peninsula of Sarayburnu, was built in the 6th century during the reign of Byzantine Emperor Justinian I. Ancient texts indicated that the basilica contained gardens, surrounded by a colonnade and facing the Hagia Sophia. This article uses material from the Wikipedia article "Basilica Cistern", which is released under the Creative Commons Attribution-Share-Alike 3.0 License.